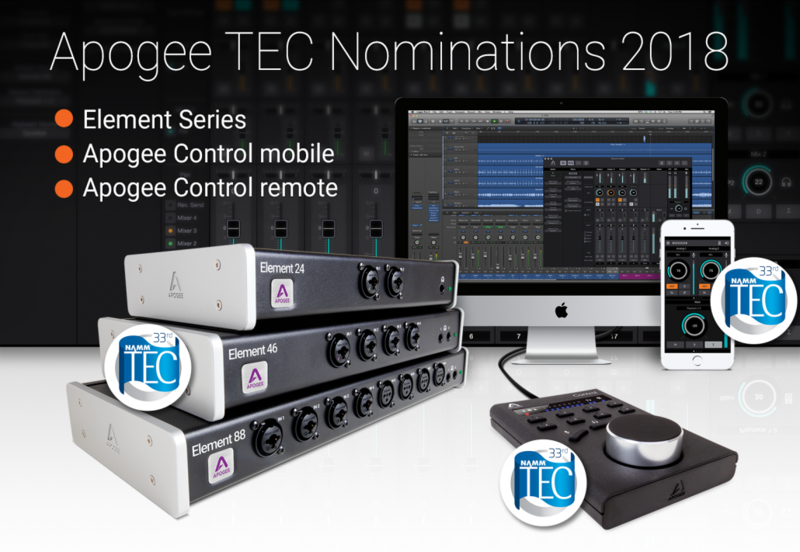 Apogee has been nominated for three TEC awards this year! In the category of Audio Apps & Hardware/Peripherals For Smartphones & Tablets, Apogee Control mobile has been recognized. Apogee Control mobile gives you wireless control of essential settings on Element Series and Ensemble Thunderbolt audio interfaces. The Element Series has been nominated in the category of Computer Audio Hardware. There are three Element series models; Element 24, Element 46 and Element 88. These streamlined, high-performance Apogee interfaces deliver flagship quality Apogee conversion and mic preamps, along with ultra-low latency Thunderbolt performance at unprecedented prices. And rounding out the nominations is the Apogee Control hardware remote in the Production Essentials category. With the Apogee Control remote, you have 8 buttons and a control knob that you can configure to access a wide range of settings on Element and Ensemble interfaces.